Yesterday we reported on a fire breaking out on 23m motor yacht Kahu, moored in East Cowes Marina on the Isle of Wight, UK. Firefighters raced to the scene to douse the flames, but, unfortunately, the 23m Nordhavn-built explorer yacht was badly damaged and sank in the marina. Approximately 30 firefighters, officers from Environmental Agency and coastguards turned up on the scene to fight the blaze and manage the damage, but despite their efforts, the fire battled into the night and the yacht sank shortly after 11 p.m. Salvage efforts to recover the vessel will be underway in the upcoming weeks, and the cause of the fire is currently under investigation. Few remnants can be seen in the Cowes Marina after the fire aboard – and sinking of – Kahu, as seen in the photo above. The Cowes Harbour Commission has taken on responsibility for managing the aftermath of the incident, including the cleanup of oil and other chemicals that may have leaked from the boat into the water, according to a spokesman for the Isle of Wight Fire and Rescue Service. 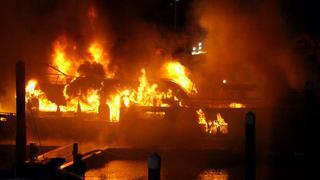 The video below shows the full force of the flames and the sad destruction of a beautiful yacht.